Contact Theatre has vacated its Manchester base during building work, and is making a virtue of necessity by creating site-specific work. Handlooms is set in a traditional sari shop and played out in one – first in Manchester and now on Leicester’s Golden Mile, retail and cultural hub of the city’s south Asian community. So cleverly blurred is the line between drama and reality, that when I’m unwittingly seized on and draped in a sari, I’m not sure whether the woman who is tucking and pleating and coaxing is indeed the owner of the shop, or whether I’ve become part of the fiction. No set dressing is needed in this rich kaleidoscope of fabric. There’s a natural stage area as well as the labyrinth of dress rails. 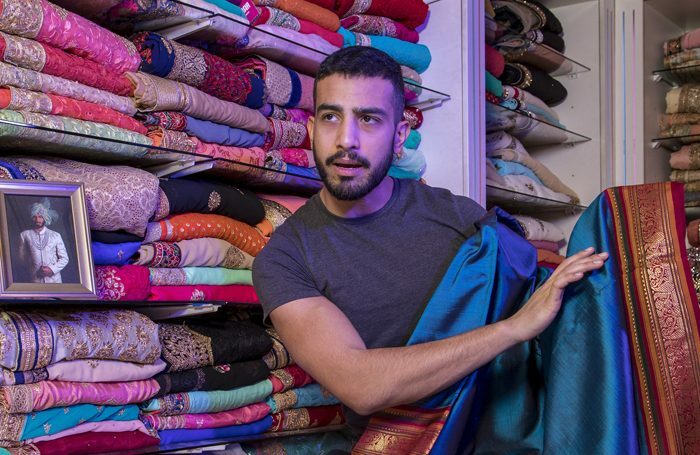 With young British Asian women increasingly opting not to wear the sari as everyday dress or – horrors – buying them ready-made online, the mother (Rani Moorthy) and son (Ashraf Ejjbair) who run the business must look to the future. It’s a unique and remarkable piece of theatre. Audio headsets feed the music of a specially compiled score and allow us to eavesdrop on intimate and sometimes riotous conversations in changing cubicles and the unseen back room. In a complex, poignant and surprising generational divide, Ranesh is the artist relishing the mystery and romance of the garment and the quality of the weaving. His mother worries about bills and leaking roofs and refugees. It’s so fresh it feels spontaneous, which is the biggest tribute of all.